Home » Mets 2015 Games » Mets Game 139: Playoffs? Playoffs? Playoffs!!! Mets Game 139: Playoffs? Playoffs? Playoffs!!! Well, now it’s official: the 2015 Mets have entered that rarefied air that only a handful of previous Mets teams have ever experienced. They are an “it” team, on one of those magical runs that comes along all too infrequently in team history. This shot, taken in a sporting goods store in Easton, PA, which is normally the intersection of Yankee and Phillies territories, tells you all you need to know. 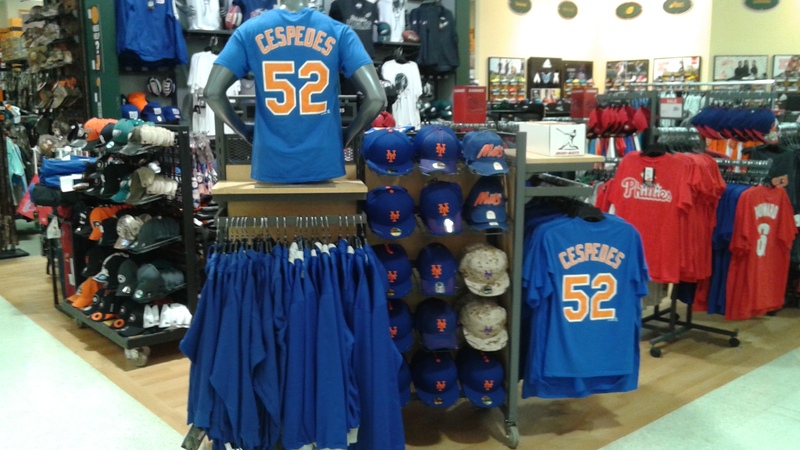 A fellow Mets fan remarked to me that they must have had that stuff in storage for years! As for the game itself, the Mets weathered superlative performances from Bryce Harper (2 HRs, 12 total bases) and Steven Strasburg (13Ks). Like a patient boxer taking a few jabs, the Mets waited until Washington lowered their guard ever so slightly and then struck hard, with homers from Kelly Johnson and Yoenis Cespedes. In a matter of seconds it seemed, the Washington Nationals where flat on their backs, staring up at the lights, contemplating plans to make tee times for early October. 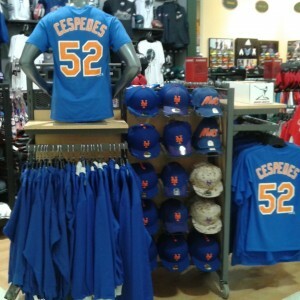 Much has been written about the Mets July additions of Cespedes, Juan Uribe and Tyler Clippard. Johnson has been somewhat easy to overlook, but he has been Terry Collins’ secret weapon of sorts since his arrival. He is the epitome of “veteran presence” (read his comments about his approach against Strasburg last night) and his ability to play all over the place has allowed Collins to give a few guys a breather and/or avoid being overmatched. Wilmer Flores had a tough night against Strasburg, but Collins had the option of using Johnson instead of the 23-year old Flores in the 8th. In the 9th, Lucas Duda, Travis d’Arnaud and Michael Conforto showed the Mets can also manufacture runs, combining to put a big insurance run on the board. Jeurys Familia did the rest. When I saw Matt den Dekker was the Nationals last hope, I knew the game was in the bag. So, the Mets sweep Washington, opening a seven game lead with 23 left to play. Washington is nearly finished, their pitching staff is in disarray, their manager appears to have lost all confidence in himself and some of the team’s veterans look like they’ve quit. They really miss Clippard and Adam LaRoche, which is what I proffered here. The Mets buried the rest of the division with their hot April start, so we are looking at a virtual victory lap between now and the start of the NLDS on October 9, hopefully at Citi Field. This is an epic time in team history and as a fan since 1971, I am savoring every moment. The trades GM Sandy Alderson made in July should go down in Mets lore, as they completely altered the season’s (and maybe the franchise’s) trajectory. By the way, just how smart is Mr. Moneyball, Billy Beane really? While his Oakland team flounders in last place, he can contemplate that in under a year, he traded away both the AL and NL MVPs. Yes, I know, Cespedes probably won’t win it, but Harper will likely be watching, rather than playing baseball this October. On a much more somber note, Friday marks the 14th anniversary of the horror that was September 11, 2001. Much water has passed under the bridge since then, but it’s a good opportunity to pause and reflect on the blessings that we do have in this life and to acknowledge the sacrifices of those who put themselves in harm’s way so we can enjoy things like baseball games. Well said. Definitely savoring this. Poor Nats. Werth suddenly looks his age, and Desmond was over-swinging like crazy. Bad timing for them to lose their most clutch hitter in Zimmerman to an oblique. As a Mets fan, though, I am loving this 7 game lead and the chance to be gentle with our players who might need some rest. As far as I can remember, this has been the most clutch run of Mets play since 1999, when the team went 65-30 from early June to mid September with lots of comeback wins thanks to the relentless offense and nasty bullpen. I remain concerned that the Mets haven’t yet performed well against good teams, and the schedule ahead isn’t giving them many opportunities. While I recognize anything can happen in the post-season (see 2006 Cardinals), the Mets need a few wins against formidable teams to reinforce the belief that they are in fact a special group of players. So far, they’ve proven they can beat up on their lessors, which is fine – good teams have to do that to win divisions. But obviously the Yankees series is huge. Yeah, 0-13 against the Pirates and Cubs is a little scary. Janish was right at the beginning of the season when he said, “I don’t think the Mets can even play .500 against the rest of MLB, so they’re going to have to really beat up on the NL East to get anywhere.” The Mets are 41-20 vs the NL East and 38-41 against everyone else. On the plus side, the one good team they’ve played well this year has been — the Dodgers! Their likely first-round opponent! The Mets took 4 of 7 from them, including winning a game started by Kershaw and another started by Greinke. Taking 3 out of 7 from the Cardinals also could imply a reasonably even contest in a theoretical NLCS. They’re a weird team — their on-paper roster might scare me the least of the probable playoff teams, but their history of clutch play is tough to beat. Unfortunately, I don’t like our matchup with the Yankees if they’re starting their best pitchers. Tanaka-Pineda-Severino would be tough. Anyone else, though… Man, how awesome would it be to help knock the Yankees out of the division race? Let’s go Jays! I think the current club might scrape to beyond .500 against the best teams (though the Pirates series doesn’t do much for my case), but that’s neither here nor there. The important thing is the Mets are winning games. While it’s pointless to look to the past as a predictor of anything, it’s instructive to point to 1988 when the Mets beat the Dodgers 11 out of 12 during the regular season, but…well, we know how the post-season went, right? Bottom line is no one knows anything, and anything can happen once the playoffs start. I’ll just be happy if/when they have the opportunity. 1988 is the template. The Mets absolutely destroyed the Dodgers head to head all year (the Dodgers won once I believe). The Mets will have to do the same thing to whomever comes out of the Central (if they get past Kershaw and Greinke). Before I place the trades into Met lore, I will have to see where the Mets are next year. That said, even if the Mets end up with a lineup similar to what it was as the beginning of this year, I’d still be happy as a team doesn’t get many of these opportunities and everyone, from Collins to Cespedes to Alderson to Familia to even Jeff Wilpon has been on top of their game. Baseball is so great, and like Mike Piazza can tell you, it can aide in healing, restoring faith, bringing a little bit of light into utter darkness. The Men and Women who worked for the greatest city on earth who perished that terrible, terrible day will always embody what it truly means to be an American. Those who gave all are sorely missed. Wow. Can anyone remember what it’s like to face competent relief pitching? Moylan actually looked good. Stupid of Fredi to go “Oh no, a lefty batter!” and pull him in favor of one of the many inept lefties. I hope Collins never does that again with O’Flaherty (not sure why Eric is still on the roster). Regardless of what hand they throw with, in important spots, you want pitchers who are actually competent pitchers. This Mets team is unreal right now, taking great ABs with their backs to the wall, taking advantage of opponent mistakes, winning with a great pitch here, a great catch there, a monster homer here, etc. No one made a huge deal of it at the time, but Conforto’s catch against Robinson’s blooper on Wednesday was a game-saver. The 2007-2014 Mets LF plays back on that and lets it fall in for a single, the gassed reliever has to throw more pitches, and the Nats rally. But Conforto hasn’t been infected by years of losing; he knows nothing but victories and confidence, so instead of getting tight out there, he went for it and made the play. I cannot wait to see if this confidence and focus lasts into the postseason. Honestly, I feel most comfortable with the new guys in that scenario, the ones who haven’t lived the tragedy of Metsdom for the past years. I hope David Wright is used as a table-setter and it’s up to guys like Conforto, Uribe and Cespedes to get the big hits. Er, my mistake, Fredi pulled Moylan in favor of one of his inept RIGHTIES. This wasn’t a “must use lefty vs Grandy & Murph” move, it was a pure “can’t let Moylan face a lefty” move. Moylan has faced 3 lefties all year. Similar sort of dumb, though.